16-bottle wine coolers offer wine lovers compact and inexpensive wine storage for home use. 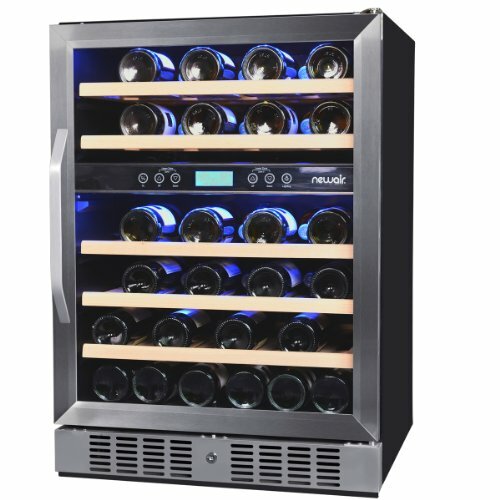 With a 16-bottle wine cooler you’ll always have a nice selection of your favorite wines on hand, chilled to the desired serving temperature. Read the following reviews of the most popular 16-bottle wine cooler refrigerators to choose the one that best suits your needs. Most of these 16-bottle wine bottle coolers are for freestanding use only but they fit nicely on a kitchen counter or table top. These appliances are easy to install and do not need much maintenance apart from occasional cleaning. The Avanti EWC1601B wine cooler is a nice small wine refrigerator that’ll take up little space in your home, yet provides proper wine storage conditions for up to 16 bottles of wine. This model is thermoelectric, meaning that it generates cool air using a state-of-the-art technology instead of traditional compressor cooling. Thermoelectric cooling is applied in small to mid-sized refrigerators and it has the benefits of silent, vibration-free, and eco-friendly (no CFC or HCFC coolants) operation which is very beneficial when storing wines. The Avanti EWC16B is a cheap, no-frills wine refrigerator with black cabinet and black-framed glass door. The door is reversible and tempered for good thermal insulation. It has recessed handle to save space. With the manual thermostat (a knob mounted in the top right-hand corner inside the cabinet) you can adjust the cooling temperature in the range of 51 – 62 °F. The knob has three settings: MIN, MED, MAX, and an OFF position. When you adjust the temperature for the first time set it to MAX, after 2 hours you can set it to MED which is at 55 °F. The OFF setting stops the cooling cycle but doesn’t shut off the power to the wine cooler. The 3 slide-out chrome-plated metal shelves are scalloped to better accommodate wine bottles (3 bottles/shelf). You can also place 4 bottles at the bottom of the cabinet. Thermoelectric wine coolers aren’t designed to operate in extreme cold or hot conditions. 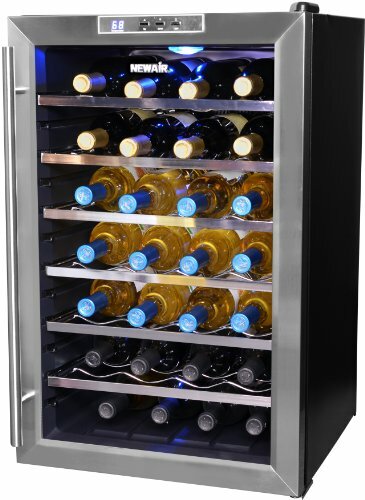 To ensure that your Avanti 16-bottle thermoelectric cooler operates efficiently and keeps your wine properly chilled place the appliance in a room where ambient temp. is between 72 – 78 °F. The wine cabinet has interior light that you can turn On/Off by pressing the light switch next to the temperature control knob in the upper right-hand corner of the cabinet. The wine cooler has leveling legs for proper placement. Price of the Avanti 16-bottle Wine Cooler: cc. US$ 100 – US$ 160 (US$ 6.25 – US$10.0 per bottle), this is one of the cheapest wine cabinets with 16 bottles capacity. Price: cc. $98 – $150. Read more about the Avanti EWC1601B Wine Chiller. Some users of this model have found the unit noisy due to the fan in the back of the cabinet. TIP: Make sure you leave some space at the rear of the unit for proper venting. The Whynter 16-bottle wine cooler is another nice, compact home wine cabinet. 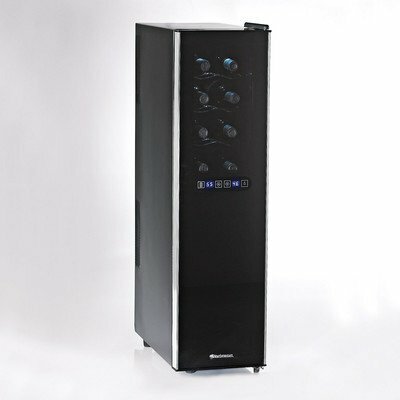 Similarly to the Avanti 16-bottle model the Whynter SNO WC-16S wine refrigerator is a thermoelectric appliance. nice digital temperature read-out and push button controls integrated in the top frame of the cabinet. By presisng the Up/Down buttons you can adjust the temperature between 52 – 64 °F. The digital control ensures more precise temperature control than a mechanic one. it looks more attractive with the shiny platinum-like finish and silver-trimmed glass door. The reversible door has a tower bar handle. The 3 wavy chrome-plated wire racks can be pulled out or completely removed. There’s interior LED lighting with On and Off switch. Price of the Whynter 16-bottle wine cooler: cc. $200 – $300 ($12.5 – $18.75 per bottle). 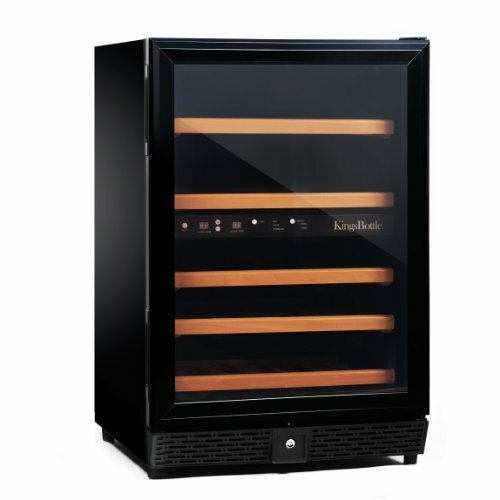 The Vinotemp VT-16TEDS freestanding wine cooler has black cabinet with stainless steel-trimmed dual-pane glass door. Digital temperature control and LED display for adjusting and monitoring the interior temperature. The temperature range of the cooler is 54 – 66 deg. Fahrenheit. 3 scalloped pull-out wire racks, each holding 3 bottles of wine. Sturdy towel bar door handle. Besides being more friendly to the environment due to lack of hazardous coolants, another benefit of a thermoelectric wine cooler is its fairly low energy consumption, if operated according to the manual. Price of the Vinotemp 16-bottle wine cooler: cc. $200 – $290 ($12.5 – $18.13 per bottle). Other Vinotemp wine cooler models. 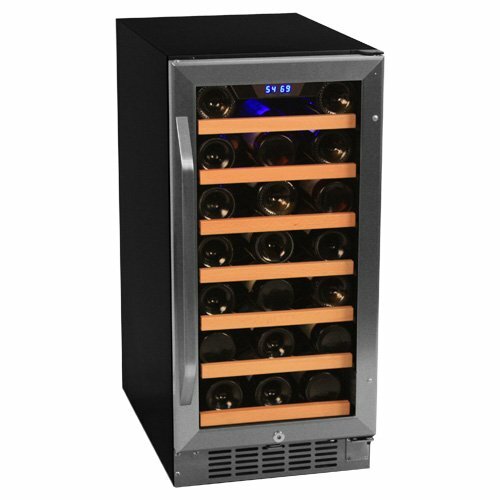 TIP: Browse also our Wine Cooler Reviews summary page to find information on various brands, sizes, and styles.